Currently 677 unique user posts. In the early weeks of January 1942, relying on an old World’s Fair guidebook to find his way, Reinhard Hardegen brought his German U-boat near the mouth of New York Harbor. A Kapitänleutnant at the time, holding the equivalent rank of a lieutenant in the U.S. Navy, he was close enough to shore that, standing on his submarine’s bridge in the dark of night, he could watch the Ferris wheel turn above Coney Island, spot the headlights of cars and see the distant glow of skyscrapers in Manhattan. That same night — by then, the morning of Jan. 15, 1942 — Lt. Hardegen and his crew fired torpedoes at the Coimbra, a British tanker ship carrying oil off the coast of Long Island. Thirty-six crew members were killed as the ship sank into the sea, its bow pointing out of the water like a buoy that, Lt. Hardegen declared, marked the way to New York City. In two patrols along the East Coast, Lt. Hardegen — who went on to achieve the rank of lieutenant commander — sank about two dozen merchant ships, part of a German military campaign to sever the supply chain between the United States and Britain. He became a hero in Germany, where Adolf Hitler personally awarded him the country’s highest military honor, but later disavowed any support for the Nazi party, became involved in German state politics and returned to the United States to speak with veterans groups and meet with the families of his wartime victims. 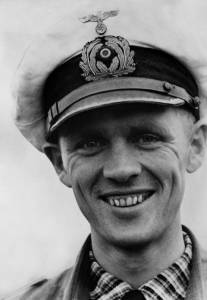 He was 105, and considered the last surviving captain of an Unterseeboot, when he died June 9, apparently in Germany. Christian Weber, president of the Bremen State Parliament in Germany, confirmed the death but did not provide additional information. A onetime navy aviator, Cmdr. Hardegen joined the German submarine division after a plane crash left him with a shortened leg and chronically bleeding stomach. He had to conceal his injuries to enter the U-boat force, according to a 2009 account in the Virginian-Pilot, but soon rose to command a submarine that sank several vessels off the western coast of Africa. In December 1941, days after the Japanese attack on Pearl Harbor, Germany declared war on the United States and began its U-boat campaign, dubbed Operation Drumbeat. Cmdr. Hardegen was given command of U-123, and on Jan. 12, 1942, about three weeks after departing from the German base in France, his submarine sank the British freighter Cyclops near Nova Scotia, killing 99 crew members. By Gannon’s count, about 5,000 people were killed by the U-boat attacks, which diminished in the second half of 1942 as merchant vessels began traveling in armed convoys, and as American forces utilized advanced radar and sonar technologies to hunt the submarines. Cmdr. Hardegen was credited by Gannon with sinking or crippling 19 ships; other sources credit him with downing about two dozen.